Public Speaking 3 Edition PUBLIC SPEAKING: THE EVOLVING ART is the first book and integrated technology package to meet the expectations of today's students while both preserving and offering innovative variations on the well-respected traditions of public speaking instruction. Throughout the text, in short video segments, four peer mentors expertly guide readers through the concepts and strategies presented in the text. 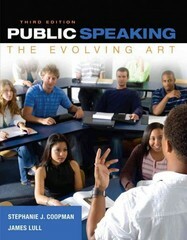 PUBLIC SPEAKING: THE EVOLVING ART is now available with MindTap Speech. MindTap Speech represents a new approach to a customizable, online, user-focused learning platform. MindTap combines all of a user's learning tools-readings, multimedia, activities and assessments-into a singular Learning Path that guides the user through the curriculum. This unique resource empowers instructors with new assessment capabilities applicable to traditional, online, and hybrid courses.